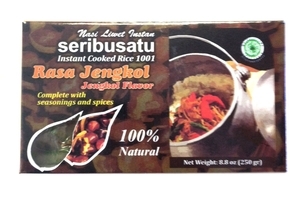 Seribusata Instant Cooked Rice 1001 Dahendi Flavor (1001 Nasi Liwet Instan Rasa Jengkol) in 8.8oz (250g) box. Complete with seasonings and spices. 100% Natural. Product of Indonesia. Halal Certified حلال .